Fearing I was failing at life, not being able to find a job in four years, but learning in the meantime how to create a website, and now at 49 years old, I am reinventing myself, in another country! It was with great excitement that this book was brought to my attention as it seemed to be directed at me. Susan Crandell, once editor in chief of More magazine, up and left her career at the age of fifty two. 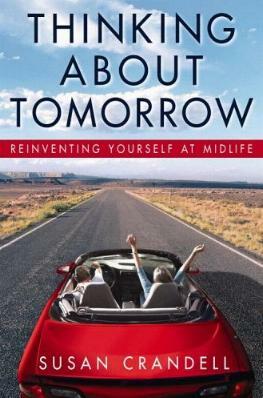 Her courage seems to be a phenomenon as she explains that the baby boomers are taking more risks with their lives at a later stage than any other generation. There are also delightful stories from others who either left their jobs or were laid off and had to scramble and start all over again. Faced with the harsh reality of being unemployed and having to earn a living to support or help support a family, is incentive enough to get one's game in gear. Ms. Crandell discusses the challenges one faces as age creeps up on us - cosmetic surgery, weightloss, setting new goals, taking chances, new and daring careers, travel, and much more. And all along I thought I was impulsive and perhaps crazy. It was heartwarming to read that two psychiatry professors say, "that immigrants, who are gutsy enough to change homelands, carry a gene for risk taking". I pray my risks pay off. If you're stuck, pick one of Susan's suggestions to modestly change your life - they're scattered throughout the book. Sometimes all you need is a flicker of an idea. Need a website for your new life? Conclusion - Very encouraging and exciting news for all of us baby boomers.